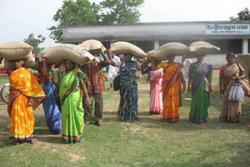 Women farmers taking away the certified seed bags of Ashoka 200F upland rice variety after a training session in Central Paraha Bhavan at Bero, Ranchi Around a million smallholders and their families in east and west India are enjoying greater food security thanks to work by researchers at Bangor University in Wales. Food security is a phrase that’s bandied about, but increasing food security can have real impact on people’s lives, and can come about by different means. In this case, the change in people’s lives has come about through the creation of a new rice variety, suitable for growing by subsistence farmers in upland regions, who have been largely ignored by India’s ‘green’ agricultural revolution. Professor John Witcombe and Dr Daljit Singh Virk of the University’s School of Environment, Natural Resources and Geography are responsible for developing the new strain, working with partners Gramin Vikas Trust (GVT), KRIBHCO Bhavan, NOIDA, New Delhi and Birsa Agricultural University, Ranchi, Jharkand, India. The new variety has rapidly become the most popular choice for growing in upland regions, which are unable to take advantage of modern rice strains developed for irrigated fertile lowlands. Its benefits are that it is both drought tolerant and gives good yields in good growing conditions. 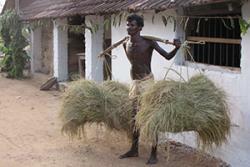 The rice, Ashoka 200F, was developed for resource-poor farmers, using a new method of plant breeding. Instead of conventional plant breeding, when thousands of plants are crossed in the hope of finding beneficial traits, fewer plants are crossed, but carefully selected for desired characteristics, such as drought tolerance and a good yield. The pioneering plant breeding method, called Client Oriented Breeding also differs from conventional commercial development of new crop strains, as it involves the growers in the selection of plant traits which will be important to them, such as good taste, short cooking time and good straw for fodder. “The figures are quite staggering,” explains Prof Witcombe. “We estimate that around a million smallholders are growing formally released Ashoka, bringing in a benefit of £12 million a year to their households. Added to that, many farmers are saving and sharing their own seeds. Where other rice varieties have failed to take hold, the approach we take, in involving farmers in the growing and selecting, ensures that we chose traits that are important to them and that they know about and are keen to grow the new variety,” said Dr Daljit Virk. “The stories from individual farmers are so real and make it very easy for us to appreciate what has been achieved. It is also very satisfying to see our varieties mainstreamed in the seed production chain. “We started on the Client Breeding Programme in about 1995 which is a very short time in plant breeding terms. With conventional approaches it would not have been possible to achieve the impact we have had. This work was recently shortlisted for the Best Cultural and Societal Impact Award in the University’s third annual Impact and Innovation Awards 2015.